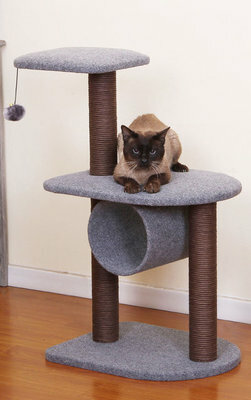 The contemporary design of this cat tree makes it the perfect addition to you home decor! Highly durable and sturdy, it's a perfect combination of form and function. Perch is felt covered cushion with a weighted bottom to help prevent tipping. Super easy to clean! lint roller or vacuum, with spot cleaning. Assembly needed! Approximately 10 mins and all tools are included. Dimensions: 20" x 15.5" x 32"